After finishing my liberal arts courses, I was on my way to do some volunteer work in Kathmandu, Nepal. Although I had already traveled extensively, this would be the first time I had a chance to fully embrace a culture totally unfamiliar to me. I wanted to work with young children and teach English. I had a chance to experience all this for an entire month at Koseli School.I was assigned to UKG or Upper Kindergarten with children ranging in age from 7-12. Although teaching did not start until noon, I often came early to be with the children, to observe how they started their day and get to know them better.Being a teacher from the States, at first glance I was surprised at the scarcity of available educational tools, but I soon realized you do what you can with what you have, and more doesn’t necessarily mean better. The children followed a routine just like students in the States do. Mine learned English, Nepali, math, and had art and gym periods. However, children seemed to be more responsible here-and respectful. They asked permission to enter any room and greeted all visitors; they swept their rooms with a broom and proudly kept it in order; their tooth brushes were hung by the windows; they ate the food that was given to them (without grimacing)and cleaned their plates afterwards;they did things they were told to do without questioning or having to be asked twice. It was refreshing. And I learned teachers are very revered here. Although I encountered some practices that were quite different from the ones I was accustomed to, I can now understand them better as I am more familiar with the culture. I don’t view them as “wrong” anymore, just a different way of doing things. All year long I thought about the children at Koseli. 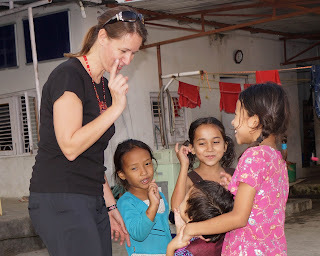 As I started my pre-teaching classes in a local school, I gave these naïve students an introduction to the Nepali culture and shared some stories of Koseli School and the students. Later in the year as I completed my degree in Early Childhood Education with the Teacher Work Sample, I again introduced new students to Koseli, and they learned about the similarities and differences between them and these other children who lived thousands of miles away. As soon as I graduated, I decided to go back to Koseli, to revisit the children who inspired me to become a teacher. I wanted to try out all the new techniques I had learned over the last year. I wondered if they would even remember me. Yes, they most certainly did remember me and we had lots of fun with creative activities. My only regret is that I was not able to spend more time with them. For all who are interested in volunteering their time here, do it. You do not need to be teachers by profession to make a difference! Everyone has knowledge to share, and these children reap the benefit of having such diversified people visit with them. They are eager to learn and such a delight to be with.